The crime busting couple treks all over the world solving crime from the American Southwest fighting "plumb loco disease", to French Rivera solving gangster crime, or an Island in the Florida Keys solving murder in the humid air. 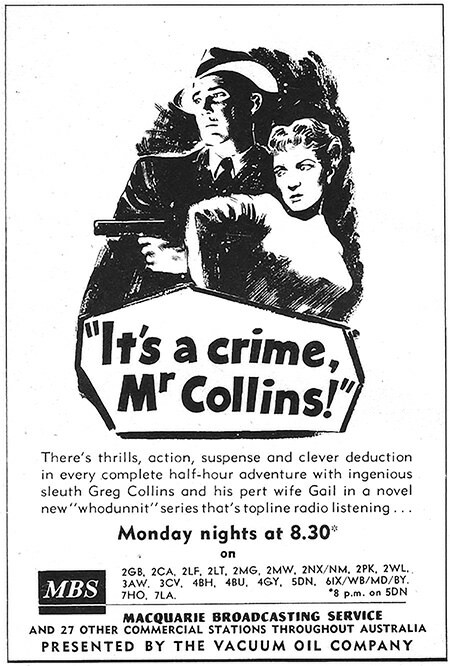 "It's a Crime, Mr. Collins, it surely is!" Running for only one season, this is a distinctive show about a sleuth in San Francisco, Greg Collins. but that fan belonged to a fan dancer. The couple treks all over the world solving crime from the American Southwest fighting "plumb loco disease", to French Rivera solving gangster crime, or an Island in the Florida Keys solving murder in the humid air. As Greg fights crime, Gail fights women off of her "favorite famous detective husband and shoe shops in fabulous places worldwide. For more detective shows, sleuth on over to Barrie Craig or the Detective Collection. Be the first to comment on "Its a Crime Mr Collins"